This is an excerpt from the April 2014 issue of Guitar World. For the rest of this story, plus an interview with Gene Simmons and much more Kiss (not to mention the Scorpions, three kings of acoustic shred, the hottest gear from the 2014 NAMM Show and more), check out the April 2014 issue at the Guitar World Online Store. Rock and Roll Hall Nite: In celebration of their upcoming Hall of Fame induction, Paul Stanley and Gene Simmons take off the makeup for a pair of revealing interviews about their 40 years in Kiss. Maybe it’s the makeup. Maybe it’s the merchandising. Maybe, at the end of the day, it’s just the music itself. Whatever the source, it is safe to say that few bands have inspired as much fervent devotion—and also rabid derision—as the self-proclaimed “Hottest Band in the World,” Kiss. Here we are in 2014, and the band, now roughly 10 lineups in with current guitarist Tommy Thayer and drummer Eric Singer, are experiencing yet another renaissance. Their most recent (and 20th) studio album, Monster, was an unusually strong effort, more energetic and enjoyable than should reasonably be expected from any band at this stage of its career. Meanwhile, on the live front, Kiss continue to push the limits of just how much of an over-the-top spectacle a rock and roll show can truly be (for evidence, check out videos of recent performances that feature their newly designed Spider stage). But 2014 is also offering up another nice pair of victories for the band. This year marks Kiss’ 40th anniversary (their self-titled debut was released in February 1974), and in April, Stanley and Simmons, along with former, and now estranged, original members Ace Frehley and Peter Criss, will be inducted into the Rock and Roll Hall of Fame. To celebrate these dual milestones, Guitar World met separately with Stanley and Simmons at their Los Angeles homes to discuss just a few of the many triumphs and tribulations that led the band here. Below is an excerpt from our interview with Paul Stanley. In the new issue, the guitarist opens up about firing Ace and Peter and why Kiss took off the makeup—and put it back on. Congratulations on your long-awaited Hall of Fame induction. Along with Rush, who were inducted last year, there is possibly no other band that has been both as successful in music and as ignored by the Hall as Kiss. But to ignore somebody with the kind of fervor that we’ve been ignored, that’s clearly a conscious decision. For better or worse, that’s not being ignored at all. When it happens year after year, that’s a choice. But on the other side of it, to me rock and roll has always been about doing what you want to do and ignoring not only your critics but also your peers. For 40 years, we’ve rarely wavered from that. So I would have to say that the same criteria that has kept us out of the Rock and Roll Hall of Fame is the same criteria that now has gotten us inducted into it. What we had at the beginning was magical. Not because we were virtuosos. Magic in rock and roll isn’t dependent on virtuosity. Ace and I played great together. But in my mind it’s a crime what Ace did. He threw away incredible potential and talent. The Ace I played with when the band first started out was a comet. And not [Frehley’s late-Eighties band] Frehley’s Comet! But he was burning bright and really had the ability—and this would rub him the wrong way—to be a real contender. But he stopped practicing. He got involved with a whole lot of things that really diluted and diminished his craft. I saw that comet grow dim. 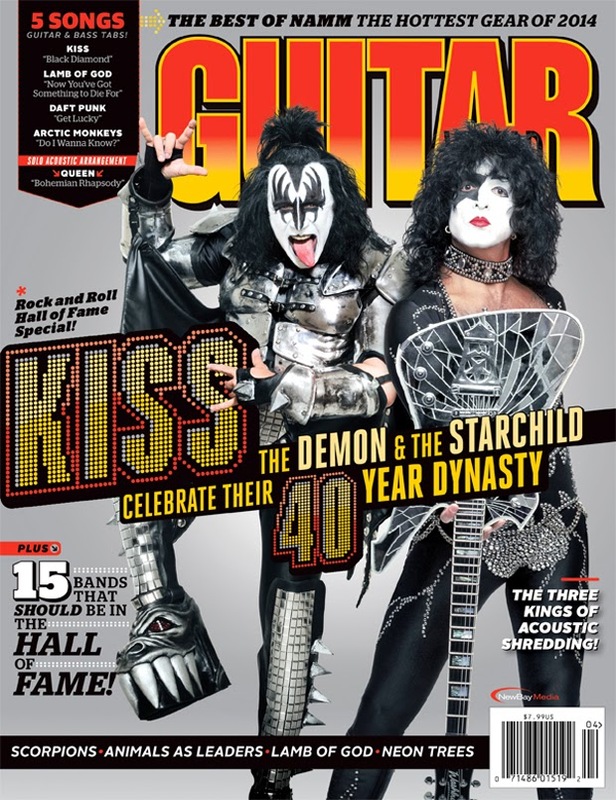 For the rest of this story, plus an interview with Gene Simmons and much more Kiss (not to mention the Scorpions, three kings of acoustic shred, the hottest gear from the 2014 NAMM Show and more), check out the April 2014 issue at the Guitar World Online Store.